Milk: As pure and safe as it seems? Is it being sufficiently monitored? Is enough being done by Government and Industry at source to prevent chemical contamination? Chemical contaminants in milk comprise chemical hazards that may introduce during milk production, dairy processing or packaging. Veterinary drugs, heavy metals, radionuclides, mycotoxins and pesticides are chemical contaminants that can enter to animal feed and they have some residues in milk. The most contentious residues that occur in milk are antimicrobial drugs. They have some hazards for humans who consume milk and dairy products. Government and producer must apply some methods and plans for prevention and control of chemical contaminants in milk and dairy products. Total quality management and the Hazard Analysis Critical Control Points (HACCP) approach has an important role for preventing and controlling of chemical contaminants in milk and dairy products, especially antibiotics in raw milk shipped from the farm. This study would have a review of materials and sources of chemical contaminants, public health concerns and the methods of for controlling of these contaminants in milk and dairy products. Gh. R. Jahed Khaniki , 2007. Chemical Contaminants in Milk and Public Health Concerns: A Review. International Journal of Dairy Science, 2: 104-115. Milk production has inextricably a linked to the environment. The latter depends largely on human activities. Uncontrolled processes interfering with the food delivering ecological system or with its natural compounds lead to residues in milk, which are not very easy to be controlled. Most of the foods produced for human consumption grow using pesticides. Chemical control of weeds, insects, fungi and rodents has enabled agricultural productivity and intensity to increase. However, these economic benefits are not without their risks to human and environmental health. Pesticides are not the only contaminants in food that may affect children's health adversely. In addition to pesticides, a large number of environmental contaminants can enter the cow as a residue of herbicides on feedstuffs or as drugs given to the cow orally, by injection, or as intra mammary infusions for the treatment of mastitis. Contaminants also enter milk from equipment after milking. Many of these compounds are fat-soluble and will be stored in adipose tissue or secreted in milk fat. Residues, particularly organochlorine pesticides which tend to accumulate in body fat, or enter to milk fat. Less lipophilic compounds and their metabolites may excrete in urine. 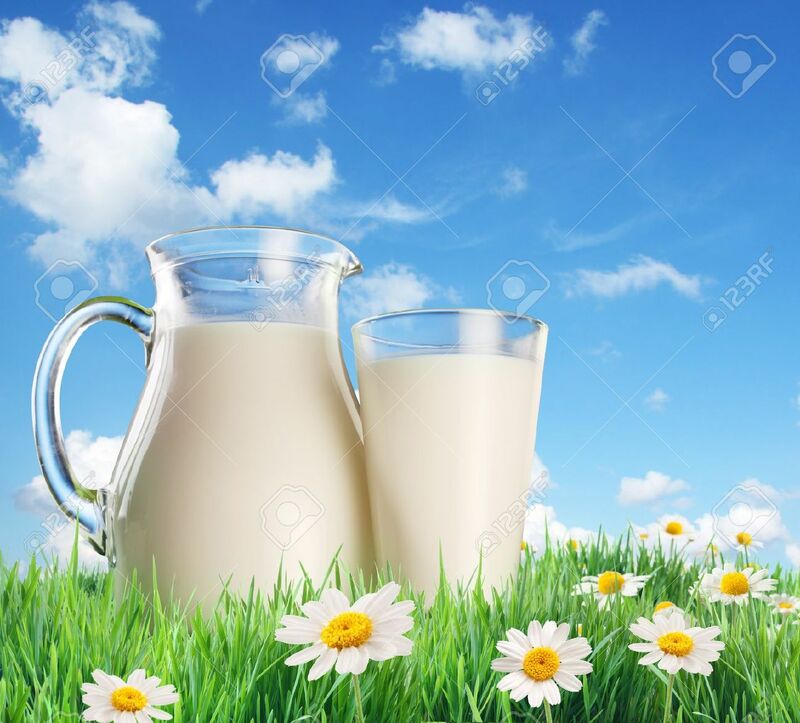 The general types of compounds which have been or are found in milk are chlorinated pesticides, organophosphates, herbicides, fungicides, anti helminthetic drugs, antibiotic and sulfonamides drugs, detergents and disinfectants, Poly Chlorinated (PCBs), Poly Brominated Biphenyles (PBBs), dioxins, mycotoxins, heavy metals and somatotropin hormone. Any of these compounds may persist at collection, preparation processes of dairy products and they considered residues (Jensen, 1995; Hubbert et al., 1996). The potential to cause toxicological harm to consumers is one characteristic in common for all of chemical contaminants (Tennant, 1997). Chemical contaminants in milk and dairy products may know to be contributory factors in several diseases such as cancer, heart disease, Alzheimer’s disease and Parkinsonism. The idea that synthetic chemicals such as DDT are major contributors to human cancer has been inspired (Ames and Gold, 1998). The occurrence of chemical residues in the milk of lactating cows is a matter of public health concern, since dairy products are widely consumed by infants, children and many adults throughout the world. In view of this, many countries have enacted regulations that limit the level of chemical residues in milk and dairy products. Milk chemical safety is important for public health. Governments need to assessment of chemical risks in people who consume contaminated milk to achieve risk communication and risk management. Total quality management and the Hazard Analysis Critical Control Points (HACCP) approach has an important role for preventing and controlling of chemical contaminants in milk and dairy products, especially antibiotics in raw milk shipped from the farm. The sources of chemical contaminants in raw materials of animal origin, mainly milk, are to a large extent comparable to those of raw materials originating from plants (DeVries, 1997). The most of chemical contaminants in milk and dairy products are veterinary drugs such as antimicrobials (antibiotics and sulfonamides), hormones, anthelminthitic drugs, pesticides and etc. Much of the veterinary treatment of dairy cattle involves intra mammary infusion of antibiotics to control mastitis. Some drugs apply to control endoparasites, ectoparasites and several illnesses and to increase milk production (Jensen, 1995; Korsrud et al., 1998). The most commonly used antimicrobials in dairy cattle can group into five major classes. These include the beta-lactams (e.g, penicillins and cephalosporins), tetracyclines (e.g., Oxytetracycline, tetracycline and chlortetracycline), amino glycosides (e.g., streptomycine, neomycin and gentamycin), macrolides (e.g., erythromycin) and sulfanomides (e.g., sulfamethazines) (Mitchell et al., 1998; Sundlof et al., 1995). These drugs are administered to animals by many routes such as injection routs, orally in the food and water, topically on the skin and by intra mammary and intrauterine infusions. Theoretically, all of these routes may lead to residues appearing in milk and dairy products (Hubbert et al., 1996; Mitchell et al., 1998). Whenever any route with an antibiotic treats a lactating cow, measurable levels of the antibiotic are usually detectable in the milk for a few days after the last. There are Maximum Residues Limits (MRLs) for some drugs in milk according EU regulations that have shown in Table 1 (Europian Commission, 1997). Milk can also consider as a rich source of steroid hormones. The amounts of lipophilic hormones depend on the fat content of the milk and dairy products. Not only progesterone but also estrone increases with fat content. Food processing does not seem to influence the amount and ratios of the hormones. Food processing, such as heating or churning, appears to have no effect on the hormones in milk and dairy products although cheese ripening does. In fresh cheese as well as in ripened cheese, testosterone was detected (0.1-0.5 mg kg-1). Probably not only propionic acid bacteria but also other fermenting bacteria or clotting enzymes are responsible for the formation of testosterone during the fermentation process (Hartmann et al., 1998). Bovine Growth Hormone (BGH) or Bovine Somatotropin (BST) is a genetically engineered protein hormone either identical or similar to the natural bovine pituitary product. Its primary function is to increase milk production dairy lactating cattle. Therefore, BST is a protein hormone that increases milk production in cows between 10 and 15% (Coghlan, 1994a; Eppard et al., 1985; Hileman, 1993a; Hileman, 1994; Hoagland et al., 1997; Londono et al., 1997; Potter, 1994; Hileman, 1993b). An increase in milk yield typically occurs with 5 days after beginning of treatment. When BST-treated cows were consuming sufficient quantities of nutrients to meet the energy needs for additional milk synthesis, body lipid mobilization did not increase, but lipid synthesis was instead reduced (Sechen et al., 1989). BGH increases activity and/or longevity of mammary secretary cells, probably via Insulin-like Growth Factor (IGF)-I produced by the liver and/or the mammary gland (Chilliard et al., 1998; FAO/WHO, 1993). IGF-I is a portion of the effects of BST on lactation in dairy cows (Cohick, 1998). The raw milk and pasteurized milk could have been levels of IGF-I of 5.6 and 8.2 ng mL-1, respectively. The infant formula could have been only trace amounts of IGF-I of 0.7 ng mL-1. Therefore, IGF-I is not destroyed by the pasteurization process but the heating of milk for the preparation of infant formula denaturizes IGF-I and significantly, reduction (35-48%) levels of IGF-I compared to raw milk(FAO/WHO, 1993). BGH is probably stimulating immunological responses of animals and hence increasing the milk cell count (Chilliard et al., 1998). It can cause to increase incidence of clinical mastitis in cows (Long, 1993; Hileman, 1993b; Coghlan, 1994b; Judge et al., 1997) and sub clinical mastitis in ewes (Brozos et al., 1998).This prompted concern that increased use of antibiotics to treat the mastitis might lead to increased residues of such drugs in milk (Long, 1993). Therefore, the risk to human health comes not from BGH residues but from the possibility that residues from the antibiotics used to treat the udder infections could end up in the milk supply (Cohick, 1998). There are many conventions about BST treated in cows. For example, an international meeting of scientists of the United States and Europe has concluded that beef raised with hormonal supplements has no adverse effect on humans and they are safe for cows and humans (Coghlan, 1994; Kaiser, 1995). However, in news of the World Trade Organization has partially accepted European Union (EU) contentions for prohibiting the use of growth-promoting hormones in cattle (Layman, 1998). Parasiticide drugs also use to remove internal parasites such as flukes, tapeworms (helminths) and nematodes (round worms) are important in animal production systems. The oxylosanide, closantel and rafoxanide are active against Fasciola hepatica (liver fluke) (Gracyey and Collins, 1992). Albendazole is a widely used benzimidazole anthelmentic that has shown efficacy against the important species of round worms, tapeworms and flukes from animals and humans. Following administration to cattle and sheep, albendazole is readily absorbed from the gut and rapidly transform to various metabolites, the major metabolites being albendazole sulfoxide, albendazole sulfone and albendazole 2-amino sulfone. These metabolites can account for all residues found in milk and dairy products at any time point that are both bioavailable and of toxicological significance (FAO/WHO, 1990; Schenck and Callery, 1998). Residues of benzimidazole compounds can occur in milk and dairy products and it is necessary to observe withdrawal periods for milk after therapy. Toxicological studies of animals have shown albendazole and its metabolites to be mutagenic. To protect the consumer from residues in marketed. A provisional maximum residue limit for total albendazole residues of 100 ng ml-1 established within the European Union (Fletouris et al., 1997). Contamination of feeds arises in the field or store where treatment with pesticides occurs. Chlorinated pesticides and related compounds such as DDT, Polychlorinated biphenyls (PCBs) and Dioxins can enter milk and dairy products. The chlorinated hydrocarbons are extremely durable, persistent, endocrine-disrupting activities, bio-accumulating and widely distributed toxic compounds that find their way into the food chain usually through use in controlling environmental or animal pests (Mukerjee, 1998). As much as 20% of an ingested chlorinated hydrocarbon excretes in milk. Chlorinated hydrocarbons adhere to milk fat and butter contains a much higher proportion of these insecticides (Hubbert et al., 1996). Residues of some chlorinated compounds in milk and dairy products show in Table 2. DDT can accumulate in fatty tissues and can transfer into milk and dairy products. Organochlorine pesticides such as DDT and Hexachlorocyclohexane (HCH) have banned in China since 1983. Residues of such compounds may persist in the environment and cause contamination through the food chain (Wong and Lee, 1997). Presented organochlorine pesticide residues (owing to their use in sanitary actions) indicating a human exposure through milk and dairy products. Some of the moulds produce various toxic metabolites under appropriate temperature and moisture conditions. These metabolites, which may be hazardous for human health, are called mycotoxins (Van Egamond, 1989; Sharma and Salunkhe, 1991). Aflatoxin M1 (AFM1) may be found in the milk of animals that are fed with Aflatoxin B1 (AFB1) containing feed (Van Egamond, 1989; Wood, 1991). It can produce by moulds of feeds that have been harvested damp, have not adequately dried, or are improperly stored. These substances through the feedstuff can infect dairy cattle. The content of AFM1 in milk is entirely dependent on the presence of the precursor AFB1 in the ration of dairy cattle and it can numerically express as feed to milk ratio. The forming of AFM1, metabolite of AFB1, occurs in liver and it secrets into milk in the mammary gland of dairy cows (Cathey et al., 1994). Many researchers reported that there was a linear relationship between the amount of AFM1 in milk and AFB1 in feed consumed by the animals. On the other hand, AFM1 levels in milk show a seasonal variation and the toxin amount have differences in the products, which are produced from the toxin containing milk. It reported that after uncovering of negative effects of aflatoxins on public health, various international foundations related with this subject paid attention and in 1993, International Agency for Research on Cancer (IARC) of WHO included AFB1 as primary and AFM1 as secondary groups of carcinogenic compounds (Cathey et al., 1994; Dragacci et al., 1995). Many countries have carried out various control and inspection programs on this subject concerning about public health for many years. According to the results obtained, maximum aflatoxin levels were determined for food and feed by considering each country’s conditions and finally regulations were established (Stahr et al., 1990; Stoloff et al., 1991; Chen and Gao, 1993). Heat treatments like pasteurization were not effective in the reduction of formation of AFM1 (Jahed Khaniki, 2006). It has relatively increased in cheese samples because of its affinity to casein fraction in milk and due to the water solubility of this toxin lower level of AFM1 was found in cream and butter than that of bulk-tank milk. All of these findings indicated that AFM1 with different levels could be available in dairy products made from contaminated milk. Consequently, this subject is a serious problem for the public health since all the age groups including infants and children consume these products worldwide. For this reason, milk and dairy products have to be inspected continuously for AFM1 contamination at least twice a year. Beside this, it is important to have low levels of AFM1 in the feeds of dairy animals and in order to achieve this purpose, feeds of dairy cows should be kept away from contamination as much as possible (Bakirci, 2001; Jahed Khaniki, 2006). Heavy metals enter the human body mainly by the routes of inhalation and ingestion. With increasing environmental pollution, a heavy metal exposure assessment study is necessary (Barbera et al., 1993; Schuhmacher et al., 1993; Ikeda et al., 1996; Raghunath et al., 1997). Heavy metals produce toxic effects by replacing essential metal ions existing in the chelates present in body. The intake via ingestion depends upon food habits. It is well established that lead (Pb) and cadmium (Cd) are toxicfor human and children are more sensitive to these metals than adults. The metals, namely copper (Cu) and zinc (Zn), are essential micronutrients and have a variety of biochemical functions in all living organisms. While Cu and Zn are essential, they can be toxic when taken in excess; both toxicity and necessity vary from element-to-element. Milk is the fundamental food for infants and the daily intake of the heavy metals Pb, Cd, Cu and Zncanb determine by different age groups of infants through different milks and baby foods. Heavy metals can enter to milk and dairy products and affect the health of people who have consumed contaminate milk and dairy products. There are various levels of heavy metals in produced milk samples of different countries (Table 3). The presence of chemical contaminants in milk are very important for consumers and it can be a matter of public health concern as well as many of unknown diseases in human because milk and dairy products are widely consumed by humans throughout the world. Primary concerns associated with antimicrobial residues in milk and dairy products do not express by the consumers. It expresses by the dairy processors who found that contaminated milk was inhibiting the starter cultures used in the production of cheeses, yoghurt and other fermented dairy products as well as influencing the results of the dye reduction tests used for milk quality at the time (Jensen, 1995; Brady and Katz, 1988; Kaneene and Ahl, 1987; Senyek et al., 1990). An important concern of veterinary toxicology is the possible transmission of harmful substances from milk and dairy products to human population. This concerns primarily antibiotics in use as feed additives. They include tetracycline, nitrofuranes and sulfonamides (DeVries, 1997).There may be biologically active metabolites of antimicrobial in milk and dairy products that could result anaphylaxis and allergic shock in sensitized individuals such as penicillin (Kaneene and Ahl, 1987; Gustafson, 1991). Penicillin is not inactivated by pasteurization or drying and levels as low as 0.03 IU mL-1 has caused skin rashes (Bjorland et al., 1998). Overuse of antimicrobial in agriculture production cause to toxicity in human and animals. They can cause some disruptions like aplasia of the bone marrow (e.g., chloramphenicol) (Mitchell et al., 1998; Jones and Seymour, 1988; Mitchell et al., 1995) and carcinogen (e.g., oxytetracycline and furazolidone). In addition, they can react with nitrite to yield (carcinogenic) nitrosamines (e.g., oxytetracycline) (Mitchell et al., 1998). They have some effects on the human gut microbial populations, the emergence of resistant bacteria within animals and the transfer of antibiotic resistance genes(R-factor) from non- pathogenic bacteria to other bacteria or human pathogens that will lead to widespread resistance (Sundlof et al., 1995; Mitchell et al., 1995; Ahl and Buntain, 1997; Bjorland et al., 1998). Therefore, the use of antibiotics in livestock species may accelerate the development of antibiotic-resistant strains of microbial pathogens, potentially complicating treatment for both animals and humans. Pesticides, e.g., Hexachlorocyclohexane (HCHs), can cause damages on central nervous system, reproductive and endocrine. Organochlorines are pesticides, which have neurotoxic and teratologic effects (Alvarado and Perez, 1998). In general, organochlorine pesticides characterize by their high lipophilicity and long elimination half-lives. Disruption of the normal homeostasis of the endocrine functions can result in developmental, reproductive, neurotoxic, carcinogenic, immunotoxic and other adverse health effects. The mechanisms of endocrine disruptive actions of these chemicals have not well understood. It is not known as to whether these chemicals act directly as hormones or modify the endocrine systems by binding to endocrine receptor sites. Disruption of normal endocrine-regulated functions by these chemicals represents an important consideration in risk assessment (Mukerjee, 1998). Mycotoxins can also present in milk and dairy products and can create public health problems in humans. The consumption by humans of aflatoxin-containing edible-tissue, other than milk, from animals that have consumed aflatoxin contaminated feed, is necessarily a matter of concern. Aflatoxin M1 in milk is a carcinogenic metabolite of aflatoxin B1. Aflatoxin M1 in milk and dairy products led to increase the risk of cancer liver (Krogh, 1987). Excretion of AFM1 into milk causes hepatocellular carcinoma in rat and rain trout. Due to the potent carcinogenicity of AFM1, most countries regulate both AFB1 in dairy cattle feed and the AFM1 in milk. The tolerance level for AFM1 in milk varies among countries from 0.05 μg kg-1in Europe to 0.5 μg kg-1 in the United States (Saitanu, 1997; WHO, 2002). The tolerance level for AFM1 in milk and dairy products in Iran is also 0.05 to 0.5 μg kg-1 (Jahed Khaniki, 2006). Governments have responsibility for making regulations to protect consumers against harm arising from chemical in food. Therefore, the National Residue Program (NRP) began in 1967. The original concern was the effect of environmental contamination, primarily from pesticides, on animals utilized for food. Today, the program includes analyses for over 100 drugs and chemical residues. The regulation of illegal residues in foods is a cooperative effort of FSIS (Food Safety and Inspection Services), FDA (Food and Drug Administration) and EPA (Environmental Protection Agency). The FDA is responsible for ensuring the safety of all food products, raw or processed, except meat, poultry and processed eggs. In addition to food, FDA is also responsible for cosmetics, drugs, medical devices, radiological products, animal drugs used in the production and treatment of food animals and for establishing maximum limits on such drugs that may be in the tissue of such animals (Tennant, 1997). Veterinary residues are regulated through Maximum Residues Levels (MRLs) which are permitted in milk and dairy products on sale. Milk must be withheld from sale for a specific period after veterinary therapy (usually 72-96 h) to ensure that no residues persist. Even with the possibility of a recognized withholding period for the milk, few drugs are authorized for use in lactating cows (Hubbert et al., 1996; Bjorland et al., 1998). Therefore, if the milk with holding times is applied, there should be no detectable residues in milk. The amounts decrease rapidly. For example, the amount of amoxicillin found in milk 36 h after an intra mammary application of 200 mg was 1 mg dL-1 (Jensen, 1995). Besides FDA, Food and Agriculture Organization (FAO) and World Health Organization (WHO) have established of MRLs and ADI of some veterinary residues in milk for consumer protection (Table 4). There are many programs for chemical contaminants prevention and control in milk and dairy products such as HACCP program and Total Quality Management and Quality Assurance program. HACCP ProgramOne very useful program for chemical contaminants control in milk and dairy products is the using of the hazard analysis critical control points (HACCP) approaches in livestocks, milk and dairy industries. The HACCP approach specifically develops for control in the food production industries. Its applications to date have focused mainly on microbiological hazards, although it also has potential application for chemical hazards (Tennant, 1997; Alli, 1992; Sischo et al., 1997). HACCP provides a useful framework that dairy plant operators can use to manage the potential risks, which their business faces. Critical Control Points (CCPs) is possible for various food chemical hazards in milk and dairy production. It should noted that a potential CCP arises each time goods move between compartments in the system, in addition to CCPs which occur within each process. This means that all milk and dairy products brought into a process, whether they be agricultural or veterinary chemicals used on farm, feed additives as a growth promotion in feed animal, or food additives used in dairy products or packaging materials used to present the final product, should be subject to the HACCP approach. Therefore, HACCP is the best suited to self-contained milk and dairy production, storage, transport, processing or retailing operations. Therefore, HACCP could have been a major role for contamination control in during milk and dairy processing (Jahed Khaniki, 2005). One principle in HACCP is the chain sources auditing. Auditing should include not only the operator’s own HACCP procedures but also those of operators up the chain. For example, milk and dairy processors buying feed animals should seek assurances that HACCP procedures applied during primary production, storage and transport insofar as this is practicable. Thus, a continuous audit trial will be formed from farm to plate so that when problems do occur they can be traced easily back to their source (Tennant, 1997). Total Quality Management and Quality Assurance ProgramResponsibility for chemical contaminants control in milk and dairy products lies with all participitants in the production process, from farmers through to consumers. Consumer and governmental concern over the potential for the introduction of chemical contaminants on the farm into the food supply is an important issue affecting policy for the livestock industry. One goal of total quality management is to prevent the occurrence of chemical contaminants, especially antibiotic residues in raw milk Shipped from the farm. An effective approach to meet this goal is the implementation of HACCP procedures, which are part of the Milk and Dairy Beef Quality Assurance Program (MDBQAP) for antibiotic avoidance (Sischo et al., 1997; Sischo, 1996) The MDBQAP was conceived as a HACCP program. The objectives of the HACCP program are to identify hazards associated with a process and to determine the acceptable limits in production process. Also, it determines the Critical Control Points (CCP) that prevent those hazards, to develop a management strategy that addresses the identified CCP, to monitor the success of the program and to make any necessary changes to management procedures in response to outcome of the monitoring. Evaluation of early implementations of the MDBQAP by representatives of milk receivers and veterinarians identified deficiencies in the MDBQAP program as a HACCP program. Although the MDBQAP clearly articulated the hazard (such as veterinary drugs) and provided critical control points to prevent the hazard in milk and dairy products, the MDBQAP failed to motivate procedures to examine their own practices carefully (Sischo et al., 1997). Contaminants in cow’s milk and dairy products cause by accidents, carelessness and overzealous use of antibiotics. Chemical contamination cannot completely prevent, or eliminate from milk and dairy products. Because milk contains the persistent fat and lipophilic contaminants will find for some time. Further, when the enormous quantity of milk produced is considered, the potential health hazard posed by the residues is almost nonexistent. The use of food safety and quality assurance in farms and plants is very important to reduce chemical contaminants in milk and dairy products. A regulatory law implementation in milk and dairy industries and long term planning is required to do milk safety. In addition, there are other items such as training of personnel or current good manufacturing practices and monitoring. Good manufacturing practices and monitoring can do by regular examination with economic penalties about chemical residues. It is useful to reduce chemical contaminants in milk and dairy products from a regulatory point. Monitoring can accompany by regular reevaluation of the acceptable levels must continue, but with the realization that some residues will probably always be found in very low quantities and they are considered to be unavoidable contaminants. Ahl, A.S. and B. Buntain, 1997. Risk and the food safety chain: Animal health, public health and the environment. Rev. Sci. Tech. Office Int. Epizooties, 16: 322-330. Alli, I., 1992. HACCP and TQC, McGill University, Canada. Alvarado, Y. and C.A. Perez, 1998. The use of biocides: An environmental problem. Interciencia, 23: 20-25. Aman, I.M. and A. Bluethgen, 1997. Occurrence of residues of organochlorine pesticides and poly-chlorinated biphenyls in milk and dairy products from Egypt. Milchwissenschaft, 52: 394-399. Ames, B.N. and L.S. Gold, 1998. The causes and prevention of cancer: The role of environment. Biotherapy (Dordrecht), 11: 205-220. Bakirci, I., 2001. Aflatoxin: A study on the occurrence of aflatoxin M1 in milk and milk products produced in van province of Turkey. Food Contr., 12: 47-51. Barbera, R., R. Farre and D. Mesado, 1993. Oral intake of Cd, Co, Cu, Fe, Pb, Ni, Mn and Zn in the University student's diet. Nahrung, 3: 241-245. Benemariya, H., H. Robberecht and H. Deelstra, 1993. Zn, Cu and Se in milk and organs of cow and goat from Burundi. Afr. Sci. Total Environ., 128: 83-98. Bjorland, J., S.A. Odegaard, S. Waage, M. Yndestad and V. Hormazabal, 1998. Concentrations of benzyl penicillin in milk of dairy cows after intra mammary administration. Norsk Veterinaertidsskrift., 1110: 5-11. Brady, M.S. and S.E. Katz, 1988. Antibiotic/Antimicrobial residues in milk. J. Food Prod., 51: 8-11. Brozos, C., P. Saratosis, C. Boscos, S.C. Kyriakis and P. Tsakalof, 1998. Effects of long-term recombinant Bovine Somatotropin (BST) administration of milk yield, milk composition and mammary gland health of dairy ewes. Small Rumin. Res., 29: 113-120. Cathey, C.G., Z.G. Huang, A.B. Sarr, B.A. Clement and T.D. Phillips, 1994. Development and evaluation of a minicolumn assay for the detection of aflatoxin M1 in milk. J. Dairy Sci., 77: 1223-1231. Cerkvenik, V. and D.Z. Doganoc, 2000. Evidence of some trace elements, organochlorine pesticides and PCBs in Slovenian Cow's Milk. Food Technol. Biotechnol., 38: 155-160. Chen, J. and J. Gao, 1993. The Chinese total diet study in 1990. Part I: Chemical contaminants. J. AOAC Int., 76: 1193-1205. Chilliard, Y., J.J. Colleau, C. Disenhaus, C. Lerondelle, C. Mouchet and A. Paris, 1998. Recombinant growth hormone: Potential interest and risks of its use for bovine milk production. A review. Productions Anim., 11: 15-32. Coghlan, A., 1994. Keep milk hormone ban, say farmers. New Scientist, 143: 8-8. Coghlan, A., 1994. Milk hormone data bottled up for years. New Scientist, 144: 4-4. Cohick, W.S., 1998. Symposium: Growth hormone and insulin-like growth factors: Role of the insulin-like growth factors and their binding proteins in lactation. J. Dairy Sci., 81: 1769-1777. DeVries, J., 1997. Food Safety and Toxicity. CRC Press, Inc., London, pp: 53-57. Dragacci, S., E. Gleizes, J.M. Fremi and A.A.G. Candlish, 1995. Use of immunoafinity chromatogrphy as a purification step for the determination of aflatoxin M1 in cheeses. Food Add. Contam., 12: 59-65. Eppard, P.J., D.E. Bauman and S.N. McCutcheon, 1985. Effects of dose of bovine growth hormone on lactation of dairy cows. J. Dairy Sci., 68: 1109-1115. Europian Commission, 1997. Regulation laying down a community procedure for the establishment of maximum residue limits of veterinary medical products in foodstuffs of animal origin. Offic. J., 224: 1-8. FAO/WHO, 1990. Residues of Some Veterinary Drugs in Animals and Foods. Vol. 41/2, FAO, Rome. FAO/WHO, 1993. Residues of Some Veterinary Drugs in Animals and Foods. Vol. 41/5, FAO, Rome. FAO/WHO, 1995. Residues of Some Veterinary Drugs in Animals and Foods. Vol. 41/7, FAO, Rome. FAO/WHO, 1997. Residues of Some Veterinary Drugs in Animals and Foods. Vol. 41/9, FAO, Rome. FAO/WHO, 1998. Residues of Some Veterinary Drugs in Animals and Foods. Vol. 41/10, FAO, Rome. Fletouris, D.J., N.A. Botsoglou., I.E. Psomas and A.I. Mantis, 1997. Determination of the marker residue of albendazole in cheese by ion-pair liquid chromatography and fluorescence detection. J. Dairy Sci., 80: 2695-2700. Gracyey, J.F. and D.S. Collins, 1992. Meat Hygiene. 9th Edn., Bailliere Tindall, UK., pp: 205-221. Gustafson, R.H., 1991. Use of antibiotics in livestock and human health concerns. J. Dairy Sci., 74: 1428-1432. Hartmann, S., M. Lacorn and H. Steinhart, 1998. Natural occurrence of steroid hormones in food. Food Chem., 62: 7-20. Hileman, B., 1993. FDA panel okays bovine growth hormone. Chem. Eng. News, 71: 5-5. Hileman, B., 1993. Growth hormone issue vexes budget talks. Chem. Eng. News, 71: 5-6. Hileman, B., 1994. Monsanto assailed for bovine hormone actions. Chem. Eng. News, 72: 7-8. Hoagland, T.A., S.A. Zinn, M.W. Tripp, D. Schreiber and W.A. Cowan, 1997. Effect of Bovine Somatotropin (BST) on milk production in angus and hereford cows. J. Anim. Sci., 75: 131-131. Hubbert, W.T., H.V. Hagstad, E. Spangler, M.H. Hinton and K.L. Hughes, 1996. Food Safety and Quality Assurance (Foods of Animal Origin). 2nd Edn., Iowa State University Press, Ames, pp: 171-179, 239-273. Ikeda, M., Z.W. Zhang and C.S. Moon, 1996. Background exposure of general exposure to Cd and Pb in Tainan city. Background exposure of general exposure to Cd and Pb in Tainan city. Arch. Environ. Contam. Toxicol., 30: 121-126. Jahed Khaniki, G.R., 2005. A model for application of hazard analysis critical control point (HACCP) system in production of Iranian white cheese stored in salt brine. Proceedings of the 8th National Congress on Environmental Health, November 8-10, 2005, Tehran, Iran, pp: 333-. Jahed Khaniki, G.R., 2006. Aflatoxin M1 related to consumption of contaminated milk and dairy products. J. Iran. Vet. Council. Jensen, R.G., 1995. Handbook of Milk Composition. Academic Press Inc., UK., pp: 887-900. Jochum, R., A. Fuchs, A. Cser, H. Menzel and I. Lombeck, 1995. Trace mineral status of full term infants fed human milk; milk based formula or partially hydrolysed whey protein formula. Analyst, 120: 905-909. Jones, G.M. and E.H. Seymour, 1988. Cowside antibiotic residue testing. J. Dairy Sci., 71: 1691-1699. Judge, L.J., R.J. Erskine and P.C. Bartlett, 1997. Recombinant bovine somatotropin and clinical J. Dairy Sci., 80: 3212-3218. Kaiser, J., 1995. Europe's beef against hormones. Science, 270: 1763-1763. Kaneene, J.B. and A.S. Ahl, 1987. Drug residues in dairy cattle industry: Epidemiological evaluation of factors influencing their occurrence. J. Dairy Sci., 70: 2176-2180. Korsrud, G.O., J.O. Boison, J.F.M. Nouws and J.D. MacNeil, 1998. Bacterial inhibition tests used to screen for antimicrobial veterinary drug residues in slaughtered animals. J. AOAC Int., 81: 21-24. Krogh, P., 1987. Mycotoxins in Food. Food Science and Technology, a Series of Monographs. Academic Press, Harcourt Brace Jovanovich, Publishers, London, pp: 43. Layman, P., 1998. Murky wto ruling on hormone-treated beef. Chem. Eng. News, 76: 12-12. Licata, P., D. Trombetta, M. Cristani, F. Giofre, D. Martino, M. Calo and F. Naccari, 2004. Levels of toxic and essential metals in samples of bovine milk from various dairy farms in Calabria, Italy. Environ. Int., 30: 1-6. Londono, A.A.S., S.D.S. Valadares Filho, J.F.C.D. Silva, J.C. Pereira, P.R. Cecon, F.A. Fonseca and F.N. Matos, 1997. Bovine somatotropin for lactating dairy cows. 1. Production and composition of milk. Revista Brasileira Zootecnia, 26: 1227-1233. Long, J., 1993. First bioengineered animal drug approved. Chem. Eng. News, 71: 9-9. Martinez, M.P., R. Angulo, R. Pozo and M. Jodral, 1997. Organochlorine pesticides in pasteurized milk and associated health risks. Food Chem. Toxicol., 35: 621-624. Martinez, P., R. Angulo, R. Pozo and M. Jodral, 1997. Levels of hexachlorobenzene (HCB) in raw milk. Alimentaria, 35: 99-101. Mitchell, J.M., M.W. Griffiths, S.A. McEwen, W.B. McNab and A.E. Yee, 1998. Antimicrobial drug residues in milk and meat: Causes, concerns, prevalence, regulations, tests and test performance. J. Food Prot., 61: 742-756. Mukerjee, D., 1998. Health risk of endocrine-disrupting ortho-substituted PCBs emitted from incinerators. Environ. Eng. Sci., 15: 157-169. Ostapczuk, P., R. Valenta, H. Rutzel and H.W. Nurnberg, 1987. Application of differential pulse anodic stripping voltammetry to the determination of heavy metals in environmental samples. Sci. Total Environ., 60: 1-6. Popelka, P., J. Nagy, R. Germuska, S. Marcincak, P. Jevinova and A.D. Rijk, 2005. Comparison of various assays used for detection of beta-lactam antibiotics in poultry meat. Food Addit. Contam., 22: 557-562. Potter, M., 1994. BST: Science's own goal. Chem. Ind., 20: 836-836. Raghunath, R., R.M. Tripathi, R.N. Khandekar and K.S.V. Nambi, 1997. . Retention times of Pb, Cd, Cu and Zn in children's blood. Sci. Total Environ., 207: 133-139. Saitanu, K., 1997. Incidence of Aflatoxin M1 in Thai milk products. J. Food Prot., 60: 1010-1012. Schenk, F.J. and P.S. Collery, 1998. Chromatographic methods of analysis of antibiotics in milk. J. Chromatog. A, 812: 99-109. Schuhmacher, M., J.L. Domingo, J.M. Liobet and J. Coebella, 1993. Dietary intake of Cu, Cr and Zn in tarragona province, Spain. Sci. Total Environ., 132: 3-10. Sechen, S.J., D.E. Bauman, H.F. Tyrell and P.J. Reynolds, 1989. Effects of somatotropin on kinetics of non estrified fatty acids and nutrition of energy, carbon and nitrogen in lactating cows. J. Dairy Sci., 72: 59-67. Senyek, G.F., J.H. Davidson, J.M. Brown, E.R. Hllstead and J.W. Sherbon, 1990. Comparison of rapid tests used to detect antibiotic residues in milk. J. Food Prot., 53: 158-164. Sharma, R.P. and D.K. Salunkhe, 1991. Mycotoxins and Phytoalexins. CRC Press, Inc., London, pp: 145-167. Sischo, W.M., 1996. Symposium: Drug residue avoidance: The use of testing quality milk and tests for antibiotic residues. J. Dairy Sci., 79: 1065-1073. Sischo, W.M., N.E. Kiernan, C.M. Burns and L.I. Byler, 1997. Implementing a quality assurance program using a risk assessment too on dairy operations. J. Dairy Sci., 80: 777-787. Stahr, H.M., R.L. Pfeiffer, P.J. Imerman, B. Bork and C. Hurburgh, 1990. Aflatoxins-the 1988 outbreak. Dairy-Food Environ. Station, 10: 15-17. Stoloff, L., H.P. Van Egmond and D.L. Parks, 1991. Rationals for the establishment of limits and regulations for mycotoxins. Food. Add. Contam., 8: 222-231. Sundlof, S.F., J.B. Kaneene and R. Miller, 1995. National survey on veterinarian-initiated use in lactating dairy cows. J. Am. Vet. Med. Assoc., 207: 347-352. Tennant, D.R., 1997. Food Chemical Risk Analysis. Blakie Academic and Professional. 1st Edn., Chapman and Hall, UK., pp: 381-398. Tripathi, R.M., R. Raghunath, V.N. Sastry and T.M. Krishnamoorthy, 1999. Daily intake of heavy metals by infants through milk and milk products. Sci. Total Environ., 227: 229-235. Van Egamond, H.P., 1989. Aflatoxin M1: Occurrence, toxicity, regulation in mycotoxins in dairy products. Elsevier Applied Publishers Ltd., London, pp: 11-55.
WHO, 2002. Evaluation of certain mycotoxins in food. Fifty-Sixth Report of the Joint FAO/WHO Expert Committee on Food Additives. WHO Technical Report Series 906, Geneva, Switzerland. Waliszewski, S.M., V.T. Pardio, K.N. Waliszewski, J.M. Chantiri, A.A. Aguirre, R.M. Infanzon and J. Rivera, 1997. Organochlorine pesticides residues in cows milk and butter in Mexico. Sci. Total Environ., 208: 127-132. Wong, S.K. and W.O. Lee, 1997. Survey of organochlorine pesticide residues in milk in Hong Kong (1993-1995). J. AOAC Int., 80: 1332-1335. Wood, G.E., 1991. Aflatoxin M1. In: Mycotoxins and Phytoalexins, Sharma, R.P. and D.K. Salunkhe (Eds.). CRC Inc., London, pp: 145-163.